Today we are going to discuss how and why to perform a voltage drop test. Hopefully you've taken the time to read our Automotive Circuit Testing article and are familiar with the basics when it comes to testing automotive electronics. We're about to take it a step further and explain the benefits of checking voltage drop across component connections, connectors and terminals. Believe it or not, it's possible to check a power supply circuit for voltage and show a good reading of 12 volts, but still have a faulty circuit. You could check that same line for resistance and show an acceptable reading of .2 ohms, and again still have a faulty circuit. Talk about throwing a wrench into the works! How can that be you may be asking yourself. Well, there are a few circuit problems that can contribute to this testing concern. A chaffed line that only has a couple of strands of wire will pass a continuity test, but certainly won't be capable of carrying any real current. Poor connections, loose crimps and corrosion issues may also test out fine on a typical voltage or resistance check, but when a load is turned on and current is needed across these circuits they likely won't perform as expected. Any increase in circuit resistance, even a very small one, is going to create problems. This is where a voltage drop test is used to pinpoint the source of the concern. Voltage drop tests are most effective with high amperage circuits, and are often used when diagnosing the starting and charging systems in automobiles. As such we will cover testing both systems in today's article. A voltage drop test is done on a "live" circuit, meaning that you must create a load in the circuit while taking your readings. Voltage will always follow the path of least resistance. A circuits wiring and connections should have next to no resistance and as such, all voltage should be used through the load. The "load" is the component using the power, such as a light, starter or blower motor. If a circuit has excessive resistance, it prevents the wire from carrying sufficient current under high load conditions. When you place your meter "across", or in parallel with the circuit you are testing, you are providing another path for the voltage to travel. If there is excessive resistance then your meter becomes "the path of least resistance" and you will register a voltage reading. If the circuit is functioning properly all voltage will pass directly to the load and your meter will register an acceptable reading. "Acceptable" for most circuits is less than .4 volts, although .1 volts or less is preferred. Some starter circuits can allow up to .6 volts during a voltage drop test. Anything higher than these values indicates a need for repair. Repair usually includes cleaning corossion from connections, repairing faulty terminal crimps or tightening fasteners and connectors. It is also possible that the wire guage is inadequate for the size of the load. In this instance a "heavier" or thicker wire is needed. So that covers the basic theory behind a voltage drop test. Now let's apply this knowledge to a couple of practical applications so we can get a better idea of where to place our test leads and how to approach a complete system. Let's start with a basic starting system. To test this system you'll need to check for excessive resistance throughout the circuit by measuring voltage drop at the battery, cable connections and starter. These readings will need to be taken while the engine is being cranked. Cranking time of around 5 seconds should be adequate for solid test results. Always remember to disable the engine so it will not start while doing these tests. If your vehicle has an inertia or fuel shut-off switch you can trip this. You could also disconnect the coil or ignition circuits or remove the fuel pump or computer relays. So let's get started. Place your DVOM (Digital Volt Ohm Meter) on the 20 volt scale. First check battery voltage by placing your meter's positive lead on the battery's positive post ( the actual post, not the clamp) and the negative lead on the negative post. We need a minimum of 12 volts to continue testing. Next, leave your meter connected and take a reading while the engine is cranking. Record this voltage reading. Now connect your postive lead to the battery terminal stud on the starter and the negative lead to the starter housing. Again, crank the engine and record the voltage reading. If the voltage reading at the starter is not within 1 volt of battery voltage then we have excessive voltage drop in the starter cricuit. We will isolate the cause by testing out the individual parts of the circuit. To check for voltage drop we can turn our meter to the 2 volt scale, or leave it set on auto if your meter is so equipped. 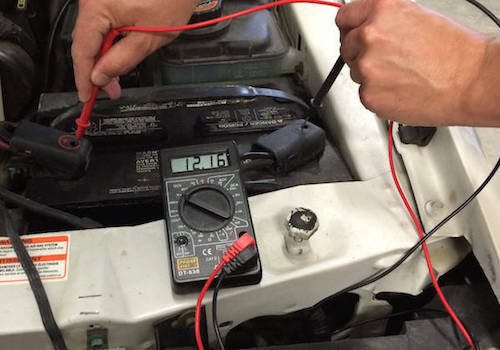 We can check total voltage drop in the starter circuit by connecting our postive meter lead to the positive battery post and the negative lead to the battery terminal stud on the starter and read the voltage while cranking the engine. Anything over .6 volts is an excessive voltage drop and can be isolated using the following steps. First, check battery post to cable connection: positive meter lead on battery positive post, negaitve lead on battery's positive cable clamp. Crank the engine and note the reading. A good connection should have zero voltage drop. Second, check the positive cable: positve meter lead on positive battery clamp, negative lead on starter terminal connector. A good cable will show a voltage drop of .2 volts or less while cranking. Third, check the starter connection: positive meter lead on positive battery terminal on the solenoid, negative meter lead on actual starter stud. A good connection will have a voltage drop of near zero volts. Now to check the negative side of the circuit. Total drop on the ground side should be .3 volts or less and can be checked by placing positive meter lead on starter housing and negative meter lead on battery ground post. Take your reading while cranking the engine, and be sure your connection at the starter is solid and clean. If total voltage drop on this side of the circuit is excessive, complete testing at all connections in the same fashion as the positive side of the circuit. Check the following: between battery post and clamp (zero voltage drop), cable end at battery to cable end at engine. (.2 volts or less), cable end at engine to engine itself (near zero voltage drop), and finally between starter housing and engine block (.1 volts or less). And that wraps up the starter circuit checks last move onto the charging circuit tests. So let's get started! First check the entire positive side of the charging circuit for excessive voltage drop. Hook your meter's positive lead to the alternator output stud and your negative lead to battery positive post. Run engine at 2,000 RPM with all lights, blower motor, radio etc. on and check voltage reading on meter. Leave the rear defroster off during this check as it may create a unusually high read. An acceptable reading is .5 volts or less. If you have an out of spec. voltage drop, check connections at alternator and battery as well as for an use of undersized cable. Check the negative side for the charging circuit the same as the positive with your meter's negative lead on the alternator case, or ground strap if equipped, and the positive lead on the batttery negative post. Voltage drop on this side of the circuit should be .2 volts or less. If it's not you know what to check and how to check it! And that wraps up our voltage drop article. I hope you have found some useful information. This is the kind of info that can save you on those hard ones. Ones that you test by the book and everything passes, yet you know there's something wrong! Good luck and enjoy the day!